Cold and flu season is almost upon us, and while there are preventive measures we can take to avoid getting sick, sometimes we just get unlucky. If you find yourself sick with a cold, you may wonder how easy you’re supposed to take it. Should you just rest on the couch or is it OK to work out when you’re all stuffy? Most health care providers agree that if your symptoms are limited to the area above your neck, it’s generally fine to break a sweat, if you feel up to it. But if your body feels achy or you have a fever or are really congested, it might be better to get some rest. Once you feel good enough to head outside or to the gym, here are the best and worst exercises to do with a cold. Taking a 20- or 30-minute walk several times a week is a great way to stay in shape. It can even ease the symptoms of your cold by allowing you to open up your breathing passages as you inhale. On the other hand, avoid long-distance endurance running when you have a cold, because studies have shown that your immune system function can be compromised for up to a day afterward. Yoga can help you reduce your stress levels, which are usually elevated when you’re fighting a cold. The gentle stretching involved in the poses can also help relieve aches and pains. Weight lifting, however, isn’t the best idea, because your strength and focus will likely be diminished, increasing your risk of injury. Lifting weights can also put extra strain on your muscles, which can make sinus pressure and headaches worse. Whether you take a dance class like Zumba or just jam to your favorite playlist at home, dancing is a good way to get your heart pumping and reduce stress without putting much strain on your body. And while you may feel obligated to participate in team sports like soccer or softball, you’re better off sitting on the bench while you’re sick. Having physical contact with others can increase the risk of spreading the cold. Your teammates might miss you out there, but they’ll be glad you’re not passing your illness on to them! As long as you feel comfortable working out and you’re not exposing others to your cold, you should be fine doing moderate exercise. If you have questions about a specific routine or think something may be out of the ordinary with your symptoms, don’t hesitate to contact your health care provider. © 2013 HealthyWomen. All rights reserved. Reprinted with permission from HealthyWomen. 1-877-986-9472 (toll free). On the Web at: www.HealthyWomen.org. Are you benefiting from working late? 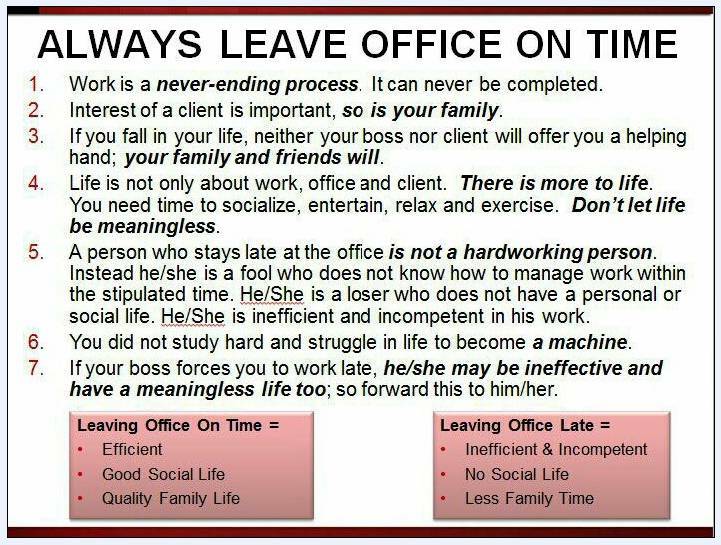 Someone forwarded the above to me and it got me wondering – are there benefits to working late? Has the person who wrote this script ever worked in an office? Surely if you were to interview people who work late they will provide some reasons and benefits why they work late, e.g – a project to complete, a deadline to meet and the rewards/bonuses they receive quarterly or yearly. You may ask- Why can’t these tasks be completed during the normal working hours? Should we stop helping our coworkers on the job or refuse to attend meetings because we have our share of work to complete because these things contribute to working late. Are the working hours structured to accommodate all the tasks we are given? You hear so many stories where in some companies, people are performing tasks that should be completed by two persons, and you know this is true because if they leave, the company divides the job functions into two positions. I recall years ago in one of my previous jobs my coworker and I left office around 1.45 am. We were trying to balance and complete financial reports for the company. Why did we do this? Surely we never thought of ourselves as being incompetent. We wanted to do a good job, make sure everything was perfect. We agreed to a deadline and we wanted to deliver. We were of the view that if you say you are going to do something you need to do it. Whether you are working for someone or working for yourself there will be a time when you have to work late and you will see the benefits – you delivered a report on time, or before time despite your various challenges, a client is happy because you were able to complete his application on time and above all you met your targets. You feel good about yourself. The flip side is whether working late is a norm for you – this is when you have to really sit down and review your position. Is this making sense? Where am I now? Where do I want to be? When do I want to get there? Will this get me there? What sacrifices do I have to make to get there? Can I do better? At the end of it all the decision is yours to make – no one can make you work late or tell you what is important to you, however you may want to bear the following in mind. Would love to hear your views, and if you need help to review your position send me an email. Every where I turn there is a hunger for respect, control, freedom and financial rewards. On the job people talk about not being respected by their peers and their managers or supervisors. 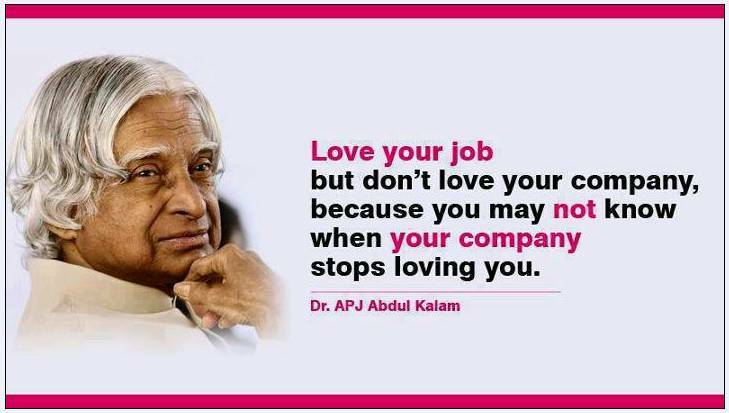 It is a fact some people on the job and even in various organizations really do not respect you and people look at various things – your education, how you dress, your family background, what type of car you drive, where you live and even who you hang out with. So we end of with this hunger for respect and some people head for entrepreneurship thinking that this would solve their problem. For some when they get there it is an eye opener because there is still the hunger for respect. As an entrepreneur you must have respect for yourself, have a mindset to succeed and develop your own personal brand. Who are you, where are you now, where do you want to go and what do you need to do to get there? These are some questions you need to focus on if you are to survive as an entrepreneur. Look around you all the successful entrepreneurs have developed their own personal brand, some examples are Tony Robbins, Melani Leshinsky, Robert Kiyosaki, Marilyn M Lynch and Mary Ellen Trevino. This has also given them more control of their lives. We all want to have control, we want to be in control of our time, where we go, when we take vacation. This can only be possible if you are an entrepreneur. When you work for someone they are in control of your time. They dictate what you do with your time every day and even weekends and when you can go on vacation. Sometimes they also dictate who you can hang with. 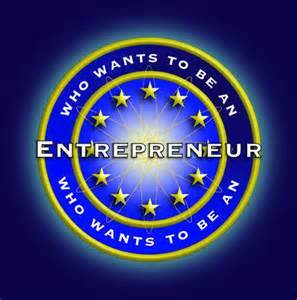 Entrepreneurs have control of their lives and the freedom to do what we want. Why do we want freedom? Everyone wants freedom. We want to do what we want when we want. We do not want anyone to tell us what to do. 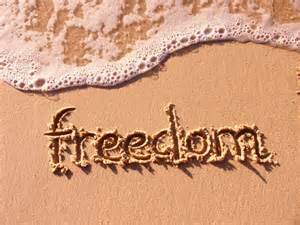 Entrepreneurs have this yearning when they are in a job, they want freedom to express themselves, freedom to be there for there family when ever they need to, to take a vacation when they want to, to purchase whatever they need without thinking twice because they can enjoy their financial rewards. You can have financial rewards working for someone but to what extent and at what cost?